OneBlood is a not-for-profit 501(c)(3) community asset responsible for providing safe, available and affordable blood to more than 200 hospital partners and their patients throughout most of Florida, parts of Georgia, Alabama and South Carolina. We distribute nearly one million blood products annually, employ more than 2,000 people, operate more than 80 donor centers and deploy nearly 200 of our signature Big Red Buses throughout our service area for blood drives. OneBlood has multiple laboratories, manufacturing and distribution sites strategically located throughout our service area enabling quick response to hospital needs and availability of blood products. Safety of the blood supply is OneBlood’s top priority. Every unit of blood undergoes more than a dozen tests to ensure it is safe for transfusion. Regardless of where the blood is donated in our service area, all blood samples are delivered via a OneBlood courier to Creative Testing Solutions (CTS), our state-of-the-art testing facility in St. Petersburg, Florida. The blood center is heavily regulated by The Food and Drug Administration (FDA). We are required to follow all FDA rules and are subject to planned and unplanned inspections to ensure complete compliance. 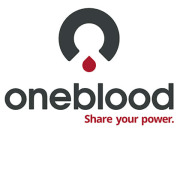 Would you recommend ONEBLOOD INC?